Objective To investigate whether symptomatic treatment with non-steroidal anti-inflammatory drugs (NSAIDs) is non-inferior to antibiotics in the treatment of uncomplicated lower urinary tract infection (UTI) in women, thus offering an opportunity to reduce antibiotic use in ambulatory care. Design Randomised, double blind, non-inferiority trial. Setting 17 general practices in Switzerland. Participants 253 women with uncomplicated lower UTI were randomly assigned 1:1 to symptomatic treatment with the NSAID diclofenac (n=133) or antibiotic treatment with norfloxacin (n=120). The randomisation sequence was computer generated, stratified by practice, blocked, and concealed using sealed, sequentially numbered drug containers. Main outcome measures The primary outcome was resolution of symptoms at day 3 (72 hours after randomisation and 12 hours after intake of the last study drug). The prespecified principal secondary outcome was the use of any antibiotic (including norfloxacin and fosfomycin as trial drugs) up to day 30. Analysis was by intention to treat. Results 72/133 (54%) women assigned to diclofenac and 96/120 (80%) assigned to norfloxacin experienced symptom resolution at day 3 (risk difference 27%, 95% confidence interval 15% to 38%, P=0.98 for non-inferiority, P<0.001 for superiority). The median time until resolution of symptoms was four days in the diclofenac group and two days in the norfloxacin group. A total of 82 (62%) women in the diclofenac group and 118 (98%) in the norfloxacin group used antibiotics up to day 30 (risk difference 37%, 28% to 46%, P<0.001 for superiority). Six women in the diclofenac group (5%) but none in the norfloxacin group received a clinical diagnosis of pyelonephritis (P=0.03). Conclusion Diclofenac is inferior to norfloxacin for symptom relief of UTI and is likely to be associated with an increased risk of pyelonephritis, even though it reduces antibiotic use in women with uncomplicated lower UTI. Antimicrobial stewardship aims at reducing antibiotic resistance by optimising or decreasing antibiotic use,1 which includes the prevention of antibiotic treatment in cases of viral infections, tailored prescription of narrow spectrum antibiotics, shortening the course of treatment, and deferring treatment for low risk bacterial infections. Urinary tract infection (UTI) is one of the most common bacterial infections in adults, affecting considerably more women than men.2 Approximately half of women have at least one UTI in their lifetime, and 20-30% have two or more.3 Antibiotic prescriptions for UTI account for 10-20% of all antibiotic prescriptions in ambulatory care and are second only to antibiotic prescriptions for respiratory tract infections.45 Reducing antibiotic prescriptions for UTI could potentially decrease the risk of antibiotic resistance. Therefore, the benefit of antibiotic treatment needs to be weighed against the potential for adverse effects, at both the individual level (adverse drug reactions) and the population level (as a driver of antibiotic resistance). Symptoms of UTI may arise from local increases in pro-inflammatory factors such as prostaglandins, and non-steroidal anti-inflammatory drugs (NSAIDs) may be useful in alleviating symptoms.678 A small randomised pilot trial, which compared the NSAID ibuprofen with the antibiotic ciprofloxacin in 80 women with uncomplicated lower UTI, concluded that symptomatic treatment with NSAIDs may be non-inferior to antibiotics, but suggested confirmation in a larger trial.9 Two adequately powered randomised double blind trials were therefore initiated simultaneously in February 2012 in Germany and Switzerland. Results of the German trial, which compared ibuprofen with fosfomycin in 494 women, were recently published.10 Here we report results of the Swiss trial, which compared diclofenac with norfloxacin in women with uncomplicated lower UTI. This randomised controlled trial with blinding of patients and assessors was conducted in 17 general practices in the German speaking part of Switzerland. All women provided written informed consent. Women aged 18 to 70 years, who visited their general practitioner because of one or more symptoms or signs typical of acute lower UTI (dysuria, frequency, macrohaematuria, cloudy or smelly urine) or self diagnosed symptomatic cystitis were eligible if their urine dipstick was positive for nitrite or leucocytes, or both. We excluded pregnant women and women with clinical signs of upper UTI such as fever (axillary body temperature >38°C), costovertebral pain or tenderness, rigors, and nausea or vomiting. We also excluded women with known or suspected anatomical or functional abnormality of the urinary tract and comorbidities such as diabetes mellitus, active gastric or duodenal ulcer disease or gastrointestinal bleeding, inflammatory bowel disease, severe liver dysfunction (liver cirrhosis and ascites), coagulopathy (including treatment with coumarine derivates), renal insufficiency grade 3 or higher (calculated glomerular filtration rate <60 mL/min), known congestive heart failure (New York Heart Association (NYHA) III or higher), psychiatric illness or dementia, inability to communicate in German or French, and any other serious comorbidity as judged by the treating doctor. In addition we excluded women with documented immunosuppression (eg, prednisone equivalent >10 mg/day for >14 days, chemotherapy, radiotherapy, immunomodulators, HIV infection, neutropenia) or hypersensitivity to one of the study drugs or a history of asthma, urticaria, or hypersensitivity-like reactions after consumption of salicylic acid or other non-steroidal anti-inflammatory drugs, as well as women with vaginal symptoms (discharge, irritation), bladder catheter in situ or during the past 30 days, recurrent UTI (more than three infections during the past 12 months), antibiotic treatment during the past four weeks, or UTI symptoms present for more than seven days before visiting the doctor. Women were randomly allocated in a 1:1 ratio to diclofenac or norfloxacin treatment. The randomisation sequence was computer generated, stratified by practice, and blocked with randomly varying block sizes of 4 and 6. Allocation was concealed with sealed, sequentially numbered opaque drug containers of identical appearance that contained opaque hard gelatine capsules of identical size and colour. Women allocated to diclofenac received capsules containing 75 mg diclofenac retard for three days (Olfen-75 duo release; Mepha Pharma, Basel, Switzerland) and women allocated to norfloxacin received capsules containing 400 mg norfloxacin for three days (Norfloxacin-Teva; Teva Pharma, Tel Aviv, Israel; or Norflocin-Mepha; Lactab, Mepha Pharma, Basel, Switzerland from October 2013 onwards owing to delivery restrictions). We chose norfloxacin because of the high susceptibility rates in Switzerland and diclofenac because of its identical frequency of being administered, which facilitated patient blinding. Women started treatment immediately after randomisation on day 0 and were advised to take two capsules each day: one in the morning and one in the evening. All women were given a single open label package of fosfomycin (Monuril; Zambon, Cadempino, Switzerland) to be taken as rescue antibiotic (3 g dose) after completion of the study drug on day 3 at their discretion, if symptoms persisted. The prespecified primary outcome was symptom resolution on day 3 (72 hours after randomisation and 12 hours after intake of the last study drug). In the absence of antimicrobial resistance, the mean duration of symptoms in women with uncomplicated UTIs treated with antibiotics is three days.11 The self report questionnaire used to ascertain severity of symptoms was developed based on questionnaires described by Clayson et al12 and Little et al.13 Women rated the severity of five UTI symptoms (dysuria, frequency, urgency, abdominal pain when passing urine, pain or tenderness in the lower back or loin) daily from days 0 (randomisation) to 10 in a diary and on day 30 by telephone interview on a Likert scale from 0 to 6, with their composite score ranging from 0 to 30. Symptom resolution was defined as 2 or less points (slight, very slight, or no problems) on all five components.121415 Complete absence of symptoms was defined as 0 points on all components. When the trial was registered on ClinicalTrials.gov (NCT01039545), the day of randomisation was defined as day 1, but for the purposes of this report it was defined as day 0. Therefore day 4, described as the time point of the primary outcome on ClinicalTrials.gov, corresponds to day 3 in this report. The prespecified principal secondary outcome was the use of any antibiotic (including norfloxacin and fosfomycin as trial drugs) up to day 30. The remaining prespecified outcomes were resolution of symptoms on day 7; complete absence of symptoms on days 3 and 7; use of rescue antibiotic (fosfomycin) up to day 3; negative urinary culture result on day 10; reconsultations because of UTI up to day 30; mean composite symptom score on days 3, 7, and 30; time until resolution of symptoms; adverse events; serious adverse events; European quality of life (EQ-5D) health state and visual analogue scale on day 3; working days lost; and overall satisfaction with management of the UTI. Additional time points analysed, which were not prespecified in the protocol but specified before statistical analysis, included days 10 and 30 for resolution and complete absence of symptoms, day 10 for symptom scores, day 3 for use of any antibiotic, and day 30 for use of rescue antibiotics. The treating doctor and an independent, blinded interviewer carried out telephone interviews on days 10 and 30, respectively, to assess serious adverse events, adverse events of grade 3 or more severity, any additional unplanned medical visits, including telephone contacts, and co-medications. The clinical diagnosis of pyelonephritis required the occurrence of loin pain and fever, leading to an unplanned outpatient visit. Mid-stream urinary samples obtained on days 0 and 10 were processed according to standard laboratory procedures, using a cut-off of ≥103 colony forming units per millilitre for a urinary culture to be considered positive16; mixed flora with no predominant microorganism, Lactobacilli or Streptococcus viridans group were considered a negative result. The supplementary appendix provides details of the baseline assessments, diaries, and scores used. We originally planned to recruit 400 women, but recruitment was slow and financial constraints led us to decide in June 2014 to stop patient recruitment by December 2014, when an expected 260 women would be included. The decision was made without inspecting the data and after repeating the power analysis based on a normal approximation test of proportions,17 which was less conservative than the simulation based approach originally used. With the original assumption of 70% of women reaching symptom resolution up to day 3 in both groups and the original, prespecified non-inferiority margin of 15% on a risk difference scale, the projected sample size of 260 women would yield a power of 84% to detect non-inferiority at a one sided type I error of 5%. A systematic review and meta-analysis by Falagas et al18 suggested symptom resolution in approximately 25% of women with UTI receiving placebo and in approximately 60% of women receiving antibiotics. The selected non-inferiority margin of 15% was less than half of the pooled risk difference between antibiotics and placebo of 35%. The primary outcome was evaluated using a risk difference with a corresponding two sided 95% confidence interval, a one sided normal approximation test for non-inferiority, and a two sided χ2 test for superiority. We compared secondary outcomes using conventional two sided P values for superiority and corresponding two sided 95% confidence intervals. We used risk differences with χ2 tests for binary data, Poisson regression with robust standard errors for counts, and linear regression with robust standard errors for continuous data. Kaplan-Meier curves accompanied by hazard ratios from Cox models were used to analyse time to definite symptom resolution and time to antibiotic use. Women were considered to have reached definite symptom resolution in the time-to-event analysis if they reached ≤2 points (slight, very slight, or no problems) on all five components of the symptom severity score and did not report a subsequent flare-up. All women were included in the analysis in the groups to which they were originally allocated (intention to treat analysis), with missing values accounted for by multiple imputation (see supplementary appendix and supplementary table 1). We performed prespecified subgroup analyses of the primary outcome accompanied by Mantel-Haenszel tests for interaction by age (<45 v ≥45 years), symptom severity at baseline (≤20 v >20), symptom duration (≤3 v >3 days), and presence of a positive urinary culture result at baseline; post hoc subgroup analyses were performed for urine leucocytes (≤++ v >++) and the presence of norfloxacin resistant Enterbacteriaceae. In per protocol analyses, we excluded women with protocol deviations, defined as women with no documented intake of at least one dose of study drug, crossovers, and women who used rescue antibiotics before day 3. These analyses were prespecified in a statistical analysis plan before the end of recruitment and inspection of the data. In sensitivity analyses specified post hoc, we fitted mixed effects models with a random intercept for trial site and multivariable Poisson and linear regression models adjusted for baseline characteristics to estimate treatment effects. For the Poisson regression models we used robust sandwich estimators of standard errors.19 We then transformed the resulting relative risks to risk differences by combining them with the control group risk in patients allocated to norfloxacin to ensure direct comparability with primary analyses. In further post hoc analyses of women allocated to diclofenac, we compared baseline characteristics and outcomes between those who used antibiotics until day 30 and those who never used antibiotics, determined the time between symptom onset and diagnosis in those with a clinical diagnosis of pyelonephritis, and explored whether blood or urine findings at baseline were associated with pyelonephritis with clinically relevant positive or negative likelihood ratios above 5 or below 0.2, respectively, which could be used to rule in or rule out a future clinical diagnosis of pyelonephritis. All analyses were done in RStudio version 1.0.143 (RStudio: Integrated Development for R. RStudio, Boston, MA www.rstudio.com/). No patients were involved in setting the research question or the outcome measures, nor were they involved in developing plans for recruitment, design, or implementation of the study. No patients were asked to advise on interpretation or writing up of results. We plan to disseminate the results of the research to all the scientific community, including trial participants. Between 7 February 2012 and 3 December 2014, 253 women were included in the trial. Thirty six patients were recruited in seven single practices, 108 in nine group practices, and 109 in one big medical centre with 17 doctors in the centre of Bern, Switzerland. One hundred and thirty three patients were randomly allocated to diclofenac and 120 to norfloxacin. A total of 125 women (94%) in the diclofenac group and 118 women (98%) in the norfloxacin group. received treatment as allocated. Follow-up until day 30 was complete for 119 (89%) and 112 women (93%), respectively (fig 1⇓). Groups were similar (table 1⇓), with a mean age of 36.8 years (SD 14.1), a mean duration of symptoms of 3.4 days (SD 2.7), and a mean composite symptom score of 13.7 points out of 30 (SD 4.0), and urgency, frequency, and dysuria as the most prevalent symptoms. Thirty five urine samples were positive for nitrite (14%) and 191 had more than ++ leucocytes (75%). Urinary cultures gave positive results for 185 urine samples (73%), resulting in a total of 193 isolates, of which 187 (97%) had documented norfloxacin susceptibility. In total, 173 isolates contained Enterobacteriaceae, 160 of which were tested for fosfomycin susceptibility and 158 were found to be susceptible (99%). Table 2⇓ presents the clinical outcomes. The primary outcome, resolution of symptoms at day 3, was observed in 72 (54%) women in the diclofenac group and 96 (80%) in the norfloxacin group (risk difference 27%, 95% confidence interval 15% to 38%, one sided P=0.98 for non-inferiority, two sided P<0.001 for superiority in favour of norfloxacin group). 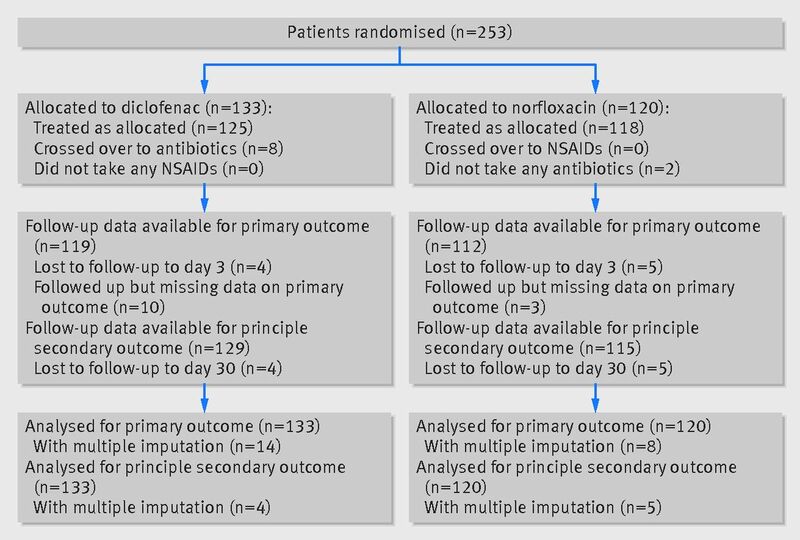 The principal secondary outcome, use of any antibiotic up to day 30, was observed in 82 (62%) women in the diclofenac group and 118 (98%) in the norfloxacin group (risk difference 37%, 28% to 46%, P<0.001 for superiority in favour of diclofenac group). Among the 82 women in the diclofenac group who used antibiotics, 58 (71%) decided to take antibiotics during the first three days; 55 of these 58 (95%) women took the rescue antibiotic fosfomycin. Supplementary table 13 presents antibiotics taken in addition to the study drugs for any indication and for recurrent UTI. Five (4%) women in the diclofenac group and 13 (11%) in the norfloxacin group took additional analgesics up to day 3. Figure 2⇓ presents time to event curves for definite resolution of symptoms (top panel) and use of antibiotics (bottom panel) until day 10 (fig 2⇓ and supplementary table 2). Supplementary figure 1 shows the course of symptom scores. 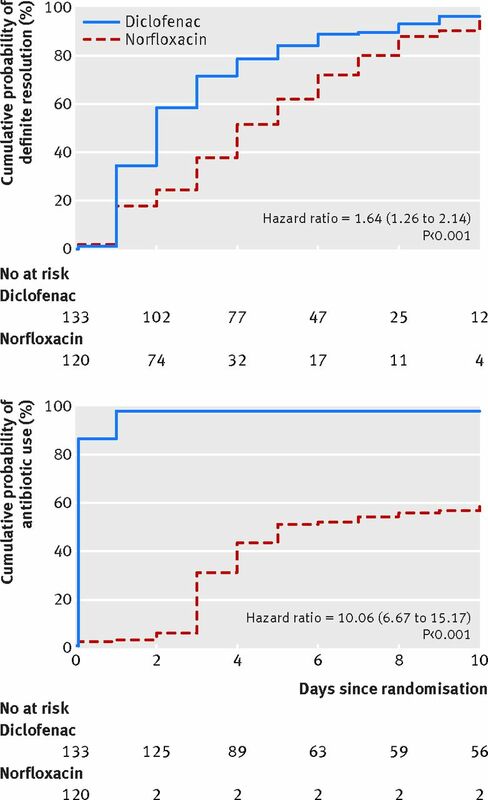 The median time until resolution of symptoms was four days in the diclofenac group compared with two days in the norfloxacin group (hazard ratio 1.64, 95% confidence interval 1.26 to 2.14, P<0.001). The median time until antibiotic use was five and zero days, respectively (10.06, 6.67 to 15.17, P<0.001). Figure 3⇓ shows subgroup analyses for the primary and main secondary outcome. Results appeared consistent across all subgroups. Sensitivity analyses revealed consistent results for the primary and main secondary outcome (see supplementary tables 3-6). The remaining prespecified outcomes favoured norfloxacin except for change in symptom score on day 30 (P=0.88) and working days lost (P=0.18, table 2⇑). Post hoc analyses of additional time points revealed little evidence of a difference between groups for resolution or complete absence of symptoms on days 10 and 30 or change of symptom score on day 10 (P≥0.07) and strong evidence for a difference in favour of the diclofenac group for antibiotic use up to day 3 (P<0.001, table 2⇑). Supplementary table 7 shows a post hoc comparison of baseline characteristics of women who had never used antibiotics (n=51) with women who had used any antibiotics until day 30 (n=82) among those randomly allocated to diclofenac. We found little evidence for a difference between groups, except for one component of the symptom composite score. Supplementary table 8 presents a comparison of outcomes. Resolution and complete absence of symptoms at day 3 were more common among women who never used antibiotics (P<0.01), changes of symptom scores were more pronounced at day 3 (P<0.01), reconsultations were less frequent (P<0.01), and scores on quality of life and satisfaction with care were higher (P<0.02). The median time to symptom resolution was three days in women who never used antibiotics and five days in women who used antibiotics (hazard ratio 0.61, 95% confidence interval 0.42 to 0.88, P<0.01, see supplementary figure 2 and supplementary table 9). Thirty four urinary cultures had been positive at baseline among women who never used antibiotics, and the results for 16 of these spontaneously became negative on day 10 (47%). Table 3⇓ presents adverse events that resulted in reconsultations: 43 events in 41 women in the diclofenac group (31%) and 22 events in 21 women in the norfloxacin group (18%). Adverse events related to UTI were more common in the diclofenac group (P=0.01), with six cases of clinically diagnosed pyelonephritis in the diclofenac group (5%) and none in the norfloxacin group (P=0.03); one woman with clinically diagnosed pyelonephritis in the diclofenac group was classified to have experienced a serious adverse event as she was admitted to hospital to receive intravenous antibiotic treatment. Supplementary table 10 shows a comparison of baseline characteristics of women with and without pyelonephritis in the diclofenac group. Supplementary table 11 presents the timing of administered antibiotics since symptom onset and randomisation, and the type of antibiotic used in the six women with pyelonephritis. The median time from symptom onset to clinical diagnosis of pyelonephritis was 5.5 days (range 5.0-8.0 days). A post-hoc analysis revealed that C reactive protein levels >10 mg/L at baseline were observed in 21 women in the diclofenac group without pyelonephritis (17%) and in three women with pyelonephritis (50%, see supplementary table 10). This resulted in a positive likelihood ratio of 3.02 (95% confidence interval 1.07 to 5.98) for C reactive protein levels >10 mg/L. None of the remaining analysed characteristics was associated with statistically significant and clinically relevant positive or negative likelihood ratios suitable to rule in or rule out a future diagnosis of a pyelonephritis (see supplementary table 12). Supplementary table 14 shows that mean symptom scores for women who developed pyelonephritis were higher at baseline and day 3 compared with women who did not develop pyelonephritis, but differences subsequently diminished. Supplementary figure 3 graphically shows the course of symptom scores in patients with and without pyelonephritis in the diclofenac group. In this randomised, double blind trial in women with uncomplicated lower urinary tract infection (UTI), symptomatic treatment with the non-steroidal anti-inflammatory drug (NSAID) diclofenac was inferior to antibiotic treatment with norfloxacin in controlling symptoms. Those treated with diclofenac were 27% less likely to have symptom resolution at day 3 after randomisation and 12% less likely to have symptom resolution at day 7 after randomisation, with higher mean symptom scores, more frequent reconsultations, a higher incidence of clinically diagnosed pyelonephritis, and lower patient satisfaction than those in the norfloxacin group. Conversely, women who received diclofenac were 37% less likely to receive antibiotics until day 30 after randomisation. The increasing antibiotic resistance among uropathogens in general and E coli (the most common uropathogen) in particular is a global concern. Many studies show a clear correlation between antibiotic consumption and rising resistance rates. Accordingly, antibiotics are often withheld in cases of self limited, benign bacterial diseases such as acute otitis media, sinusitis, and traveller’s diarrhoea at the cost of a prolongation of symptoms by typically 1-3 days.2930313233343536 Our results in women with uncomplicated lower UTI are well in line with the prolongation of symptoms observed with symptomatic treatment of these conditions. As many women in the diclofenac group resorted to antibiotic treatment in our trial, a strategy of selectively deferring rather than completely withholding antibiotic treatment may be preferable for uncomplicated lower UTI.37 This can be achieved through a shared decision making process, during which clinicians inquire about their patients’ ideas and expectations about antibiotic treatment for uncomplicated UTI and also explore the option of delaying antibiotic use as a treatment strategy. Subgroup analyses did not provide evidence for any clinically relevant treatment by subgroup interactions. In particular, in contrast with the study by Gágyor et al,10 reduction in antibiotic prescription was comparable in women with and without positive urinary culture results. Testing initial urine samples for other biomarkers associated with UTI, such as heparin binding protein, interleukin 6, acetic acid, trimethylamine, xanthine oxidase, myeloperoxidase, or others,383940 might have resulted in promising treatment by subgroup interactions, but these tests are not yet established in clinical practice, and we are unaware of any evidence to suggest that such interactions would be likely. In subgroup analyses, there were no relevant differences in baseline characteristics that would allow an early identification of women likely to benefit from diclofenac alone. However, in additional post hoc analyses, which were purely hypothesis generating, we found that the clinical diagnosis of pyelonephritis was established not earlier than five days after symptom onset, and that C reactive protein values >10 mg/L were more common at baseline in women who subsequently had a diagnosis of pyelonephritis. Taken together, these exploratory findings could support a tailored strategy of immediate antibiotic use in women with C reactive protein levels >10 mg/L and symptomatic treatment in remaining women for up to three or four days after symptom onset, followed by deferred, selective antibiotic use in those women who did not show a clear improvement by then. Naturally, such a tailored strategy would need to be evaluated in an appropriately powered randomised trial. Our trial should be interpreted in view of its strengths and limitations. Strengths are its randomised double blind design with appropriate concealment of allocation; blinding of patients, therapists, and outcome assessors; the low loss to follow-up; the robustness of results in a series of sensitivity analyses; and the multicentre primary care setting. The premature termination of patient recruitment before reaching the initially planned sample size is an obvious limitation. However, the decision to stop recruitment was made without inspecting the data and is therefore unlikely to have biased our findings.41 Despite the smaller than originally planned sample size, our results are completely unequivocal. The self report questionnaire used to ascertain severity of symptoms was developed based on questionnaires described by Clayson et al12 and Little et al,13 which were available at the time of designing our trial. Women had to rate the severity of dysuria, frequency, urgency, and abdominal pain when passing urine and pain or tenderness in the lower back or loin on Likert scales from 0 to 6. The resulting summary score from 0 to 30 used to assess symptom severity as one of the secondary outcomes was not psychometrically validated and should therefore be considered exploratory. The primary outcome of symptom resolution at day 3 was defined as slight, very slight, or no problems reported for all five components.121415 As these components assessed well established concepts and the calculation of a summary score was not necessary, we consider our primary outcome to be valid. A final limitation is that our results are not generalisable to countries and clinical settings with lower rates of susceptibility, which could decrease the effectiveness of antibiotics and render symptomatic treatment with NSAIDs less inferior. Symptomatic treatment is inferior to antibiotic treatment for women with uncomplicated lower UTI in an ambulatory setting, as it increases median symptom duration by two days and is likely to be associated with an increased risk of clinically diagnosed pyelonephritis. The observed clinically relevant reduction in antibiotic use, which would likely contribute directly to decreasing resistance rates in the affected population, suggests that alternative approaches of combining symptomatic treatment with deferred, selective antibiotic use should be developed and tested in future trials. We thank the patient participants; the doctor participants for their meticulous data collection; CTU Bern, the clinical trials unit of the University of Bern for the development of the database (Malcolm Sturdy), monitoring (Lucia Kacina), and telephone interview and data clearance (Madeleine Dähler); the Institute of Primary Health Care BIHAM (Berner Institut für Hausarztmedizin), for its organisational support; and the hospital pharmacy of Inselspital for the production and blinding of the study drugs (Marco Eschenmoser). Participating doctors: Peter Duner, Eggiwil; Christoph Fry, Belp; Ursula Grob, Herzogenbuchsee; Felix Huber, Zürich; Beat Köstner-Mösching, Neuenegg; Andreas Kronenberg, Bern; Corinna Kronenberg, Stettlen; Danielle Lemann, Langnau; Damian Meli, Huttwil; Gabriele Reinheimer, Worb; Véronique Rigamonti Wermelinger, Bern; Ralf Schäfer, Bern; Urs Schneeberger, Niederönz; Christian Studer, Luzern; Fritz Weber, Buchs; Doris Zundel, Bätterkinden; and Anne-Marie Zundel Funk, Zollikofen. Contributors: AK, KM, and PJ conceived and designed the study and obtained funding. AK, MB, DM, and PF acquired the data. LB, BRdC, AL, SR, and PJ did the analysis and interpreted it in collaboration with the remaining authors. AK and PJ are the guarantors of the study results, had full access to the final data, cowrote the manuscript, and had final responsibility for content and the decision to submit for publication. All authors critically revised the paper for important intellectual content and approved the final version. Funding: This study was supported by the Swiss National Foundation (project 32003B_130867), Swiss Academy of Medical Sciences, SwissLife foundation, and Else Kroener-Fresenius foundation. PJ is a tier 1 Canada research chair in clinical epidemiology of chronic diseases. This research was completed, in part, with funding from the Canada research chairs programme. The funding bodies were not involved in the design or the conduct of the trial, nor in the writing of the manuscript or the decision to submit the manuscript for publication. The funding bodies only had access to the data after finalisation of the statistical analysis plan and completion of all analyses. Competing interests: All authors have completed the ICMJE uniform disclosure form at www.icmje.org/coi_disclosure.pdf and declare: no support from any organisation for the submitted work besides the acknowledged financial support. AK has received travel grant and meeting expenses from Gilead, Viofor, and the World Health Organization, is advisor of the Swiss Federal Office of Public Health concerning antibiotic resistance epidemiology in Switzerland, and provides non-interpreted annual resistance data to LEO Pharma and the Swiss government. PJ has received research grants to the institution from Astra Zeneca, Biotronik, Biosensors International, Eli Lilly, and The Medicines Company for cardiovascular trials, and serves as unpaid member of the steering group of cardiovascular trials funded by Astra Zeneca, Biotronik, Biosensors, St Jude Medical, and The Medicines Company. The remaining authors declare no financial relationships with any organisations that might have an interest in the submitted work in the previous three years and no other relationships or activities that could appear to have influenced the submitted work. Ethical approval: This study was conducted in accordance with the Declaration of Helsinki and was approved by the local research ethics committee and the Swiss Agency for Therapeutic Products, swissmedic. Data sharing: The statistical analysis plan and the final version of the study protocol are available from the corresponding author. Anonymised patient level data will be made available from the corresponding author at the Institute for Infectious Diseases, University Bern on reasonable request. Consent was not obtained for data sharing but the presented data are anonymised and risk of identification is low. No additional data are available. Transparency: The lead authors (AK and PJ) affirm that the manuscript is an honest, accurate, and transparent account of the study being reported; that no important aspects of the study have been omitted; and that any discrepancies from the study as planned (and, if relevant, registered) have been explained. Organization WH. Global Action Plan on Antimicrobial Resistance.WHO Library Cataloguing-in-Publication Data, 2015. Foxman B. Epidemiology of urinary tract infections: incidence, morbidity, and economic costs. Am J Med2002;359(Suppl 1A):5-13. doi:10.1016/S0002-9343(02)01054-9 pmid:12113866. Foxman B, Brown P. Epidemiology of urinary tract infections: transmission and risk factors, incidence, and costs. Infect Dis Clin North Am2003;359:227-41. doi:10.1016/S0891-5520(03)00005-9 pmid:12848468. Mühlemann K. Surveillance of antibiotic prescription in the outpatient setting using the national Sentinel network (OP-159, http://www.smw.ch/docs/PdfContent/smw-12931.pdf). WONCA World Organization of National Colleges, Academies and Academic Associations of General Practitioners/Family Physicians; 2009; Basel. Switzerland; 2009. Lundborg CS, Olsson E, Mölstad S. Swedish Study Group on Antibiotic Use. Antibiotic prescribing in outpatients: a 1-week diagnosis-prescribing study in 5 counties in Sweden. Scand J Infect Dis2002;359:442-8. doi:10.1080/00365540110080647 pmid:12160172. Farkas A, Alajem D, Dekel S, Binderman I. Urinary prostaglandin E2 in acute bacterial cystitis. J Urol1980;359:455-7. doi:10.1016/S0022-5347(17)55493-2 pmid:6999176. Schwarz NT, Jung SY, Kalff JC, Chancellor M, Bauer AJ. Bacterial toxin N-formyl-methionyl-leucyl-phenylalanine acutely contracts human and rabbit detrusor through the release of eicosanoids. J Urol2002;359:2603-12. doi:10.1016/S0022-5347(05)65045-8 pmid:11992095. Poljakovic M, Svensson ML, Svanborg C, Johansson K, Larsson B, Persson K. Escherichia coli-induced inducible nitric oxide synthase and cyclooxygenase expression in the mouse bladder and kidney. Kidney Int2001;359:893-904. doi:10.1046/j.1523-1755.2001.059003893.x pmid:11231344. Bleidorn J, Gágyor I, Kochen MM, Wegscheider K, Hummers-Pradier E. Symptomatic treatment (ibuprofen) or antibiotics (ciprofloxacin) for uncomplicated urinary tract infection?--results of a randomized controlled pilot trial. BMC Med2010;359:30. doi:10.1186/1741-7015-8-30 pmid:20504298. 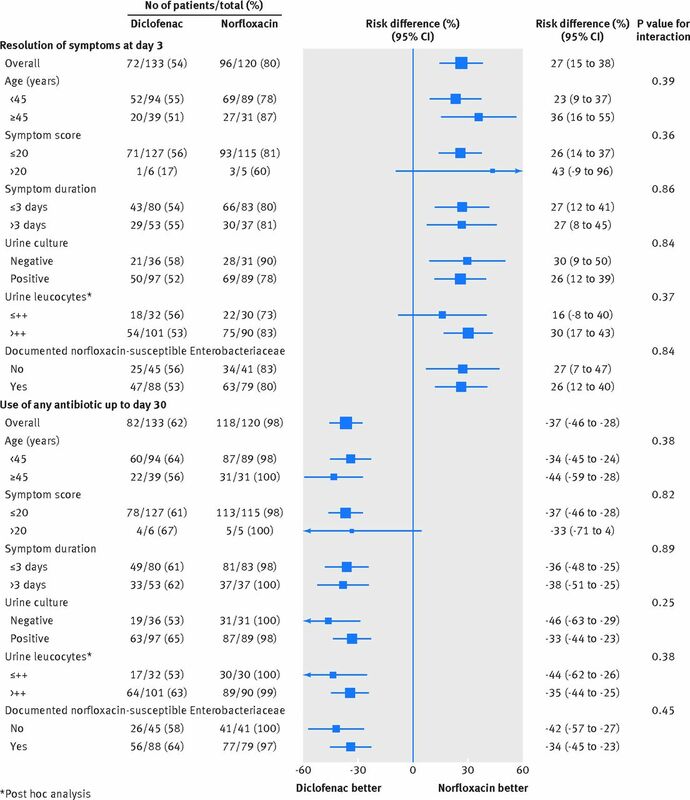 Gágyor I, Bleidorn J, Kochen MM, Schmiemann G, Wegscheider K, Hummers-Pradier E. Ibuprofen versus fosfomycin for uncomplicated urinary tract infection in women: randomised controlled trial. BMJ2015;359:h6544. doi:10.1136/bmj.h6544 pmid:26698878. Little P, Merriman R, Turner S, et al. Presentation, pattern, and natural course of severe symptoms, and role of antibiotics and antibiotic resistance among patients presenting with suspected uncomplicated urinary tract infection in primary care: observational study. BMJ2010;359:b5633. doi:10.1136/bmj.b5633 pmid:20139213. Clayson D, Wild D, Doll H, Keating K, Gondek K. Validation of a patient-administered questionnaire to measure the severity and bothersomeness of lower urinary tract symptoms in uncomplicated urinary tract infection (UTI): the UTI Symptom Assessment questionnaire. BJU Int2005;359:350-9. doi:10.1111/j.1464-410X.2005.05630.x pmid:16042729. Little P, Turner S, Rumsby K, et al. Dipsticks and diagnostic algorithms in urinary tract infection: development and validation, randomised trial, economic analysis, observational cohort and qualitative study. Health Technol Assess2009;359:iii-iv, ix-xi, 1-73. doi:10.3310/hta13190 pmid:19364448. Gupta K, Hooton TM, Roberts PL, Stamm WE. Short-course nitrofurantoin for the treatment of acute uncomplicated cystitis in women. Arch Intern Med2007;359:2207-12. doi:10.1001/archinte.167.20.2207 pmid:17998493. McNulty CA, Richards J, Livermore DM, et al. Clinical relevance of laboratory-reported antibiotic resistance in acute uncomplicated urinary tract infection in primary care. J Antimicrob Chemother2006;359:1000-8. doi:10.1093/jac/dkl368 pmid:16998209. Chow S-C, Shao J, Wang H. Sample Size Calculations in Clinical Research. 2nd edn. Chapman & Hall/CRC; 2008. Falagas ME, Kotsantis IK, Vouloumanou EK, Rafailidis PI. Antibiotics versus placebo in the treatment of women with uncomplicated cystitis: a meta-analysis of randomized controlled trials. J Infect2009;359:91-102. doi:10.1016/j.jinf.2008.12.009 pmid:19195714. Zou G. A modified poisson regression approach to prospective studies with binary data. Am J Epidemiol2004;359:702-6. doi:10.1093/aje/kwh090 pmid:15033648. Christiaens TC, De Meyere M, Verschraegen G, Peersman W, Heytens S, De Maeseneer JM. Randomised controlled trial of nitrofurantoin versus placebo in the treatment of uncomplicated urinary tract infection in adult women. Br J Gen Pract2002;359:729-34.pmid:12236276. Ferry SA, Holm SE, Stenlund H, Lundholm R, Monsen TJ. Clinical and bacteriological outcome of different doses and duration of pivmecillinam compared with placebo therapy of uncomplicated lower urinary tract infection in women: the LUTIW project. Scand J Prim Health Care2007;359:49-57. doi:10.1080/02813430601183074 pmid:17354160. Bucher HC, Guyatt GH, Griffith LE, Walter SD. The results of direct and indirect treatment comparisons in meta-analysis of randomized controlled trials. J Clin Epidemiol1997;359:683-91. doi:10.1016/S0895-4356(97)00049-8 pmid:9250266. Little P, Moore M, Kelly J, et al. PIPS Investigators. Ibuprofen, paracetamol, and steam for patients with respiratory tract infections in primary care: pragmatic randomised factorial trial. BMJ2013;359:f6041. doi:10.1136/bmj.f6041 pmid:24162940. Basille D, Plouvier N, Trouve C, Duhaut P, Andrejak C, Jounieaux V. Non-steroidal Anti-inflammatory Drugs may Worsen the Course of Community-Acquired Pneumonia: A Cohort Study. Lung2017;359:201-8. doi:10.1007/s00408-016-9973-1 pmid:28005149. Le Bourgeois M, Ferroni A, Leruez-Ville M, et al. Children, Antibiotics, Nonsteroidal Anti-inflammatory Drugs and Childhood Empyema (ChANCE) Study Group. Nonsteroidal Anti-Inflammatory Drug without Antibiotics for Acute Viral Infection Increases the Empyema Risk in Children: A Matched Case-Control Study. J Pediatr2016;359:47-53.e3.pmid:27339249. Mazumdar K, Dutta NK, Dastidar SG, Motohashi N, Shirataki Y. Diclofenac in the management of E. coli urinary tract infections. In Vivo2006;359:613-9.pmid:17091768. Obad J, Šušković J, Kos B. Antimicrobial activity of ibuprofen: new perspectives on an “Old” non-antibiotic drug. Eur J Pharm Sci2015;359:93-8. doi:10.1016/j.ejps.2015.02.011 pmid:25708941. Gottesman BS, Carmeli Y, Shitrit P, Chowers M. Impact of quinolone restriction on resistance patterns of Escherichia coli isolated from urine by culture in a community setting. Clin Infect Dis2009;359:869-75. doi:10.1086/605530 pmid:19686074. Glasziou PP, Del Mar CB, Sanders SL, Hayem M. Antibiotics for acute otitis media in children. Cochrane Database Syst Rev2004;(1):CD000219.pmid:14973951. Falagas ME, Giannopoulou KP, Vardakas KZ, Dimopoulos G, Karageorgopoulos DE. Comparison of antibiotics with placebo for treatment of acute sinusitis: a meta-analysis of randomised controlled trials. Lancet Infect Dis2008;359:543-52. doi:10.1016/S1473-3099(08)70202-0 pmid:18718440. Ahovuo-Saloranta A, Borisenko OV, Kovanen N, et al. Antibiotics for acute maxillary sinusitis. Cochrane Database Syst Rev2008;(2):CD000243.pmid:18425861. Del Mar CB, Glasziou PP, Spinks AB. Antibiotics for sore throat. Cochrane Database Syst Rev2006;(4):CD000023.pmid:17054126.
de Bruyn G, Hahn S, Borwick A. Antibiotic treatment for travellers’ diarrhoea. Cochrane Database Syst Rev2000;(3):CD002242.pmid:10908534. Genton B, D’Acremont V. Evidence of efficacy is not enough to develop recommendations: antibiotics for treatment of traveler’s diarrhea. Clin Infect Dis2007;359:1520, author reply 1521-2. doi:10.1086/517837 pmid:17479953. Tan T, Little P, Stokes T. Guideline Development Group. Antibiotic prescribing for self limiting respiratory tract infections in primary care: summary of NICE guidance. BMJ2008;359:a437. doi:10.1136/bmj.a437 pmid:18650239. Rovers MM, Glasziou P, Appelman CL, et al. Antibiotics for acute otitis media: a meta-analysis with individual patient data. Lancet2006;359:1429-35. doi:10.1016/S0140-6736(06)69606-2 pmid:17055944. Little P, Moore MV, Turner S, et al. Effectiveness of five different approaches in management of urinary tract infection: randomised controlled trial. BMJ2010;359:c199. doi:10.1136/bmj.c199 pmid:20139214. Kjölvmark C, Påhlman LI, Åkesson P, Linder A. Heparin-binding protein: a diagnostic biomarker of urinary tract infection in adults. Open Forum Infect Dis2014;359:ofu004. doi:10.1093/ofid/ofu004 pmid:25734078. Lam CW, Law CY, To KK, et al. NMR-based metabolomic urinalysis: a rapid screening test for urinary tract infection. Clin Chim Acta2014;359:217-23. doi:10.1016/j.cca.2014.05.014 pmid:24909875. Ciragil P, Kurutas EB, Miraloglu M. New markers: urine xanthine oxidase and myeloperoxidase in the early detection of urinary tract infection. Dis Markers2014;359:1-5. doi:10.1155/2014/269362 pmid:24591758. Bassler D, Briel M, Montori VM, et al. STOPIT-2 Study Group. Stopping randomized trials early for benefit and estimation of treatment effects: systematic review and meta-regression analysis. JAMA2010;359:1180-7.pmid:20332404.